Black lacquer and chinoiserie decorated eight day longcase clock, striking the hour, the 12" brass arched dial signed Henry Baker, Malling, on a silvered boss to the arch over a silvered chapter ring enclosing a matted centre with subsidiary seconds dial and calendar aperture; the case with long moulded arched door decorated overall with figures in pagoda landscapes; the hood with a rounded moulded cornice surmounted by three ball and eagle brass finials, 86" high (pendulum, two weights and door key and winding key). The hood has glass panels in each side so the 5 pillar movement may be seen; these are signs of a quality clock. The case has beautiful raised Chinoiserie work, completely unrestored, and thus distressed in part. 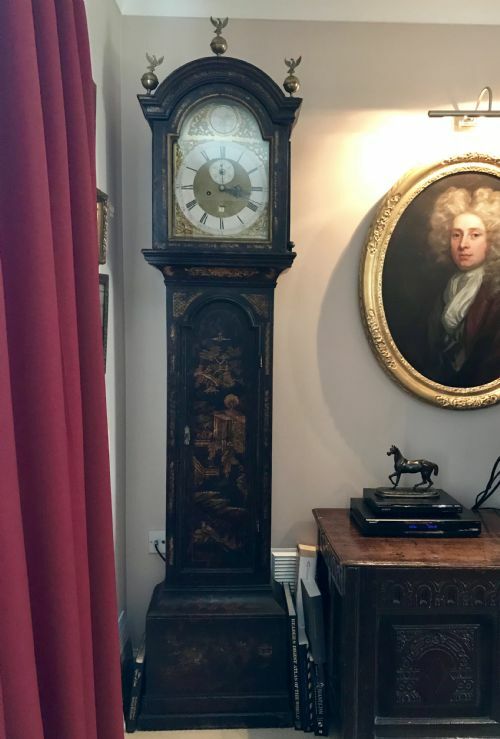 The clock can be accurately described as in 'country house condition', with an excellent subdued patina, unlike some which have been garishly 'restored'. There is a small piece of moulding missing from the door, next to the escutcheon, and there is a 19th century strengthening addition of a small plinth at the very foot of the clock. The movement is in perfect working order, keeping good time and striking the hour. SIZE: 86 inches tall, 18.5 inches wide, 8.75 inches deep. PROVENANCE: Dorset country house collection, until bought about 25 years ago by the previous owner. He had the movement and face restored but left the case in original condition.